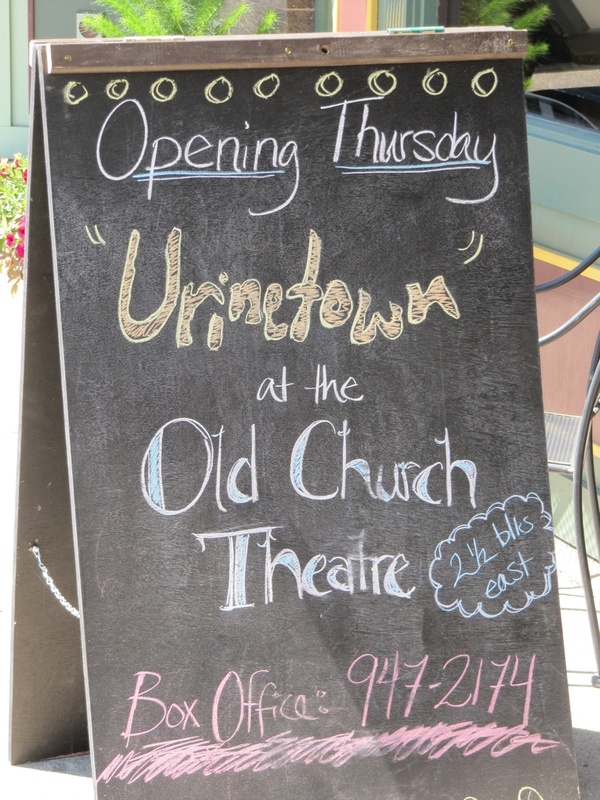 Urinetown signage in downtown New Rockford, North Dakota. and the arts: to provoke, to disrupt, and therefore clear the mental cobwebs and encourage thinking outside of our cerebral boxes. This theme smacks of several works of political economy, art, and theater, at least since Thomas Malthus (which Deb mentions in the pamphlet) laid out his ideas in the early 19th century that concerned population dynamics. As the planet becomes increasingly populated, it’s always interesting to hypothesize how private and public institutions will manage all of us locally and internationally (life is one big private and public protracted exercise in management). “Urinetown” also reminded me of “Soylent Green,” starring the late Charlton Heston. Put out in 1973, “Soylent Green” was set in the future, in 2022 (or a decade away), and this perhaps is one of the most memorable and understandably recycled lines from the flick. The drawback of “Soylent Green,” though, is that it’s a movie, and as with all movies, the viewer or movie-goer cannot have the real-time attachment to the actresses and actors as they can when they take in live theater. With the movie, only the viewer can develop a delusional engagement and one-sided friendship with the Hollywood actor on screen (the Hollywood actress or actor simply could not have friendships with the volume of people they attract). With live theater, though, the actors and actresses get to respond accordingly to the audience. There is an interplay, a continued back and forth. 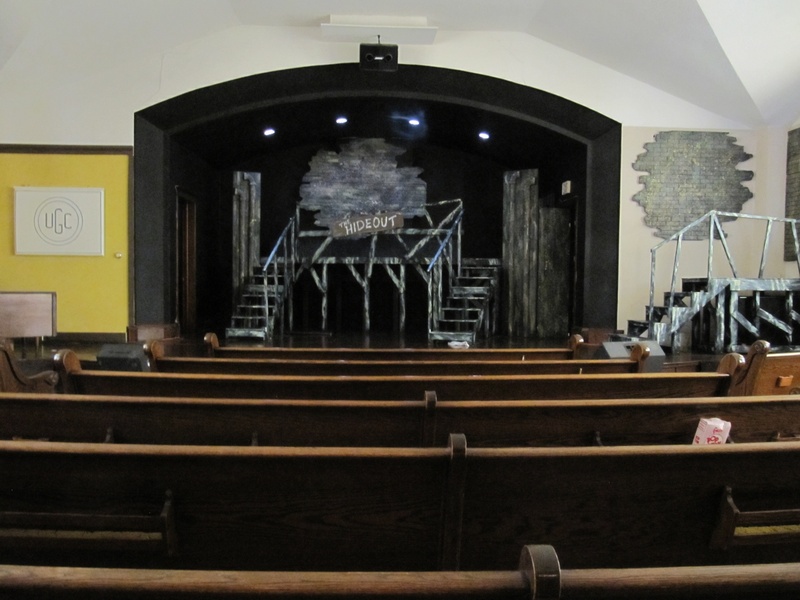 The Urinetown stage set in the Old Church Theater in downtown New Rockford, North Dakota. This is something the philosopher, historian and archaeologist R.G. Collingwood was deeply concerned about in the first half of the twentieth-century, especially as art became increasingly mechanized (now, for example, we put money into electronic Jukeboxes to hear music instead of bringing in live bands; or we often expect live bands to simply play cover songs; and just yesterday a friend used an iPhone ap to communicate with the electric Jukebox across the room and select songs without even having to get up from his table — this simultaneously didn’t surprise me while blowing my mind). But enough of my ramblings. Go to New Rockford and see “Urinetown.” Click here for the schedule. This entry was posted on Thursday, July 5th, 2012 at 3:42 pm	and posted in Uncategorized. You can follow any responses to this entry through the RSS 2.0 feed.